Creamy, dairy free coconut curry butternut squash soup is a perfect tribute to cooler fall weather. 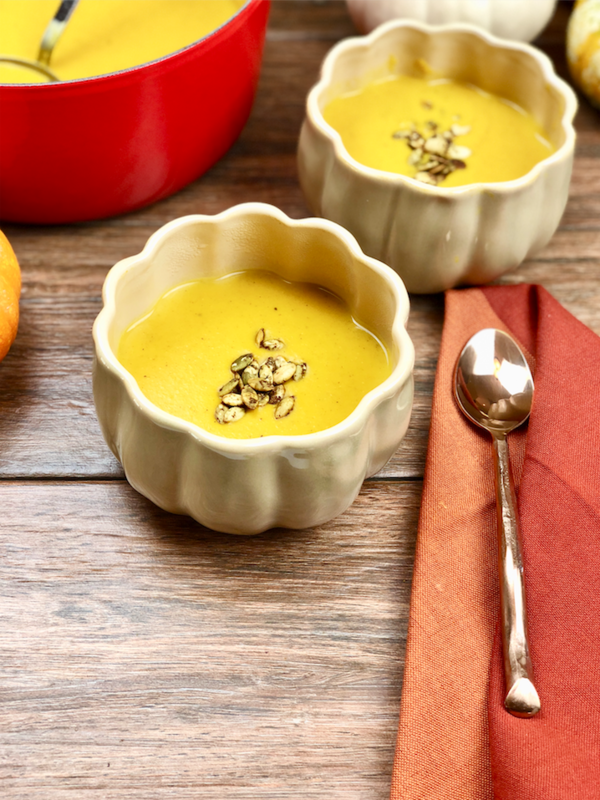 The luscious soup uses roasted butternut squash, which is definitely a worthwhile extra step in making the most amazing butternut squash soup you’ve ever had! I love everything about squash – so you’ll be getting a few butternut squash recipes, acorn squash and spaghetti squash recipes from me over the next few days. 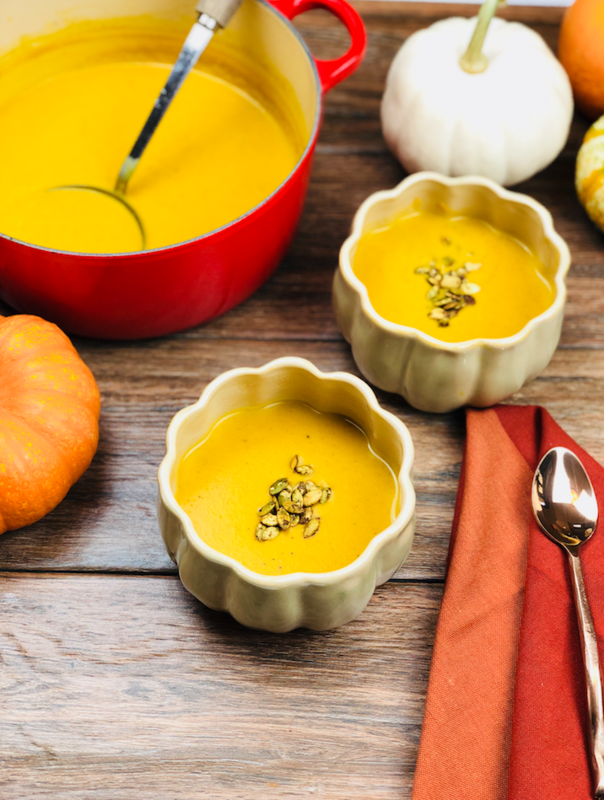 Winter squash is the best reflection of fall because it’s ripe and in-season, so your meals taste extra fresh and delicious when you use seasonal ingredients. Safeway has all winter squash on sale for just $.99 a pound right now through the month of November. 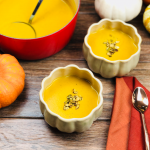 There are many butternut squash soup recipes out there – and many just use chopped butternut squash that you soften in simmering hot broth. I’ve made at least 15 butternut squash soup recipes and I’ve found that roasting the squash first is THE way to go to get the best flavor. Roasting the squash adds another layer of sweetness to the soup through the caramelization of the squash. I like to let my squash get some brown bits because those brown caramelized pieces are the most flavorful in my opinion. Start with a whole butternut squash. Wash it, peel it and chop it. You can see how I do this in the video below. Chop into 1 1/2 inch chunks, then toss with some olive oil, or liquified coconut oil, salt and pepper and roast the squash for about 30 minutes until its soft and tender. While the squash is roasting, chop the onion, saute in oil, add the curry spices and when the squash is roasted, pour it right in with the curried onions. Add creamy coconut milk (Safeway has a Signature Kitchens brand of canned lite coconut milk), and your favorite broth. I used O Organics vegetable broth, but you can also use chicken broth if you wish. Simmer for about 15 minutes then puree the soup in a blender or use an immersion blender to make it smooth and creamy! This recipe is super easy, very basic and amazingly delicious. If you want even more flavor, consider adding a tablespoon of ground cinnamon and some chopped garlic. It makes for a more complex tasting soup. In a large stock pot or dutch oven, heat 1 tablespoon olive oil or coconut oil and saute onions until soft and fragrant.